The TSGS Cruiser: "Digging Up Info About Premature Burials"
posted a photo of a neat little child's coffin from the Ft. Vallonia, Indiana Museum with a small wooden top that slid to one side and you could view the child thru a glass cover. I pointed out that besides the viewing that it might also provide evidence if the child had not actually died because the inside of the glass would fog over if the little one was still alive, even with the faintest of breathing. This would be similar to using a mirror to see if it would fog-up from someone that was believed to have died. Before embalming became the norm, there existed enormous fear by some people of premature burials or being buried alive... this fear is known as taphephobia. The fear was increased by the tales of people being found in coffins that were clawed on the inside and splinters from the wooden coffin under the “victims” finger nails! 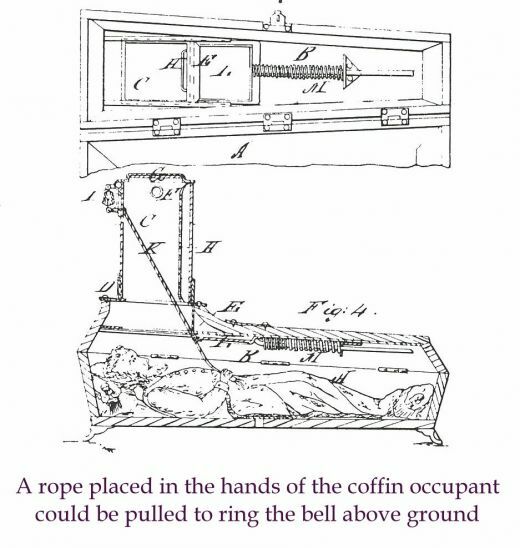 Those with this fear went to great expense to have a safety coffin made that would help against a premature burial. Many of these coffins would involve a string tied to their hand and would be attached to a bell or to a spring loaded flag that could be activated by the “deceased” if they should awaken after burial. Some would be designed to signal others before burial. I had said in my comments to Mark's photo that this was where the phrase “grave shift” came from. With my recent “digging up” of some facts about all of this, I learned that my statement might not be true, even-though it clearly stands to reason that if you had a safety coffin, that you would have secured people to watch and listen for your signal. The “graveyard shift” originated, as some believe, to refer to the work shift between the hours of Midnight and 8AM when there was more chance of accidents, etc. I had heard many years ago that the shift was so named because it was harder on people to work those hours or that they would not get as much rest as the more “normal” hours would provide and thus could send you to an early grave. Since, I have pointed out the possible incorrect origin for “graveyard shift,” I feel like I have the obligation to point out 2 other myths. 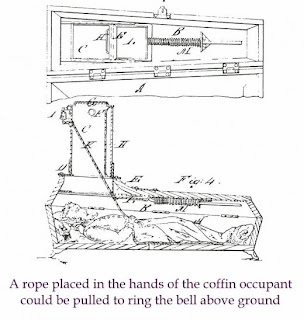 “Dead Ringer” is believed to not have anything to do with a safety coffin or a premature burial. Instead it has to do with horse racers where a substitute or “ringer” was put in that looked very similar to another horse to fool the horse betting bookies... “dead” was added like in “dead on” and people would say things like “Bob is a dead ringer for his Uncle Ralph!” The second myth is “saved by the bell” which came from boxing, not someone from the grave ringing to be saved! The boxer was about to get knocked completely out but the bell was rung for the end of the round just in time! - Written and compiled by JGWest.